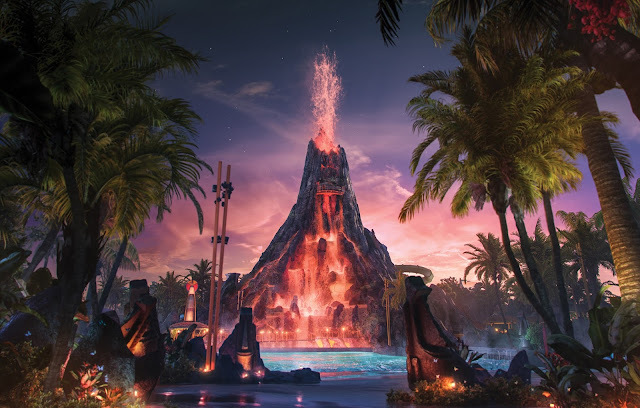 Volcano Bay water "theme" park will have it's grand opening May 25th after three days of media previews and events. We've known the park will open no later than June 1st for some time now, but Universal now confirms the first official date of operation. Lots of work still remains to finish the park, including the wave pool, lazy river, completing the volcano, laying pavement, and installing scenery and landscaping. But recently some of the slides have started testing the water pumps. Universal has confirmed that Team Members will have a preview period for the new park and it is likely soft openings will occur prior to the grand opening.